Fun fact: Sun Valley is a town, a region, and a ski area. The town of Sun Valley is home to the Sun Valley Resort, which includes the lodge, golf course, Nordic skiing tracks, and Dollar Mountain (a small ski hill for beginners, with a big terrain park for the hardpack huckers). A mile or so away is the town of Ketchum that is full of charm, history, nightlife, and local flavor. 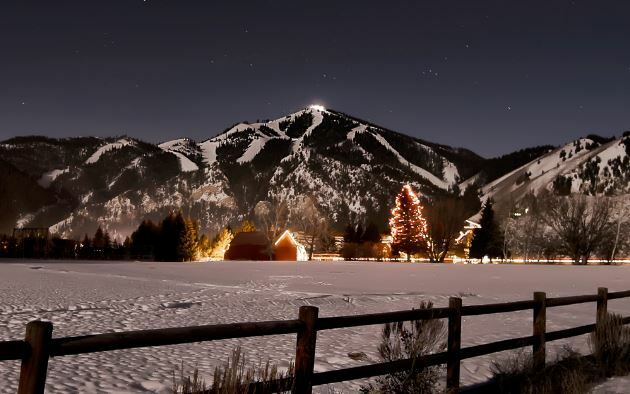 Towering above the town of Ketchum is Bald Mountain (aka Baldy), the crown jewel of Idaho ski resorts. Together, the resort, the town, and the ski area can all be referred to as Sun Valley. Taking its rightful place amongst North America’s most legendary ski areas, Sun Valley’s Bald Mountain serves up a unique and world-class ski experience. Some skiers, however, are quick to dismiss Baldy due to its fancy day lodges, low annual snowfall (220 inches, on average) and absence of cliffs, chutes, and other natural features. All of which is true, to some extent. Sun Valley’s tree-cut runs and wide, open bowls don’t have the same alpine gnarl factor that other more jagged ski areas feature. But don’t be so quick to dismiss Sun Valley. The ski resort, which opened in 1936, has a cemented place in skiing lore, and skiers who have spent time here know this place is legit. Easy access from town with 3,100 feet of sustained fall-line skiing and a cool ski patrol overseeing an open boundary policy combine to create a no-nonsense ski experience not easily found these days. This is a mountain where skiers come to ski—not to be seen or be a part of something cool. Skiing here is all about feeling the raw and continuous tug of gravity. For once a skier commits to Baldy’s uninterrupted fall line and surrenders to her relentless pull, her true beauty is revealed. Here’s all you need to know to make the most of skiing at Sun Valley.